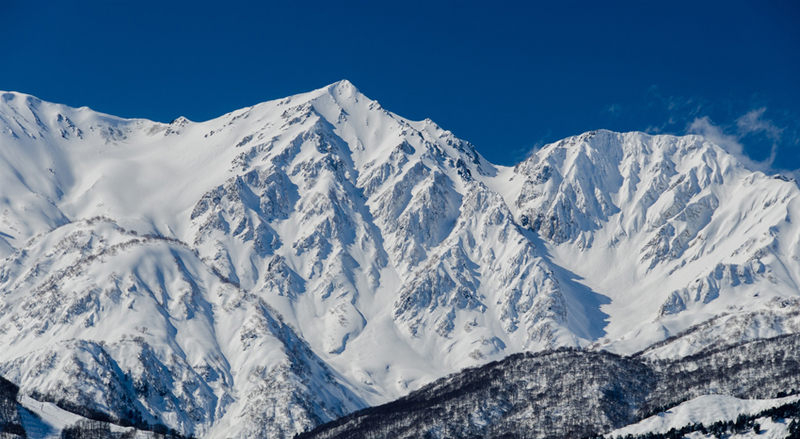 There are bus services that operate from Narita Airport and other starting points going directly to Hakuba. The local Oito-sen train line travels through the valley from Itoigawa City in Niigata Prefecture to Matsumoto City north to south. Most people coming from the Tokyo region will arrive via Nagano Station on the Hokuriku Shinkansen. The Hokuriku Shinkansen ('bullet train') line was previously generally known as the Nagano Shinkansen. A new extended section of line connecting Nagano with Kanazawa in Ishikawa Prefecture was opened in the spring 2015, when the Shinkansen line took on its intended title - the Hokuriku Shinkansen. This Hokuriku Shinkansen now connects Tokyo Station directly with Kanazawa Station in Ishikawa Prefecture, stopping at Nagano Station on the way. The journey from Tokyo Station to Nagano Station takes around 90 minutes, depending on which train you catch. There is no direct train line from Nagano Station to Hakuba Station, so most people heading to Hakuba take a bus from Nagano Station, whether it be arranged by their accommodation or one of the available public buses. The Hakuba bus stop is Number 6 and found on the East Exit of Nagano Station. The journey to central Hakuba village from Nagano Station by bus takes around 1 hour. The Shinano Limited Express train on the Chuo Honsen departs from Nagoya Station and heads for Matsumoto where you can change to the Oito-sen which heads north and stops at Hakuba Station and the other nearby local stations in the valley including the Kamishiro Station near the Hakuba Goryu resort. (Some services are direct, some services require change at Shinano Omachi Station). Take the Sanyo Shinkansen to Nagoya and then transfer to the Chuo Honsen, as above. The Hakuba Valley Shuttle Bus connects all of the resorts in the Hakuba Valley group. This shuttle bus service is free of charge except for the Konayuki line bound for Hakuba Cortina which costs 500 yen. There are four different lines (routes) covering the area. Taking a bus is much quicker! Oito-sen from Hakuba Station to Matsumoto Station. Hokuriku Shinkansen from Itoigawa Station to Ueda Station. Sugadaira is about 25km from Ueda Station. Hokuriku Shinkansen from Itoigawa Station to Iiyama Station. Hokuriku Shinkansen from Itoigawa Station to Nagano Station. Nagano-sen (Nagaden) from Nagano Station to Yudanaka Station. 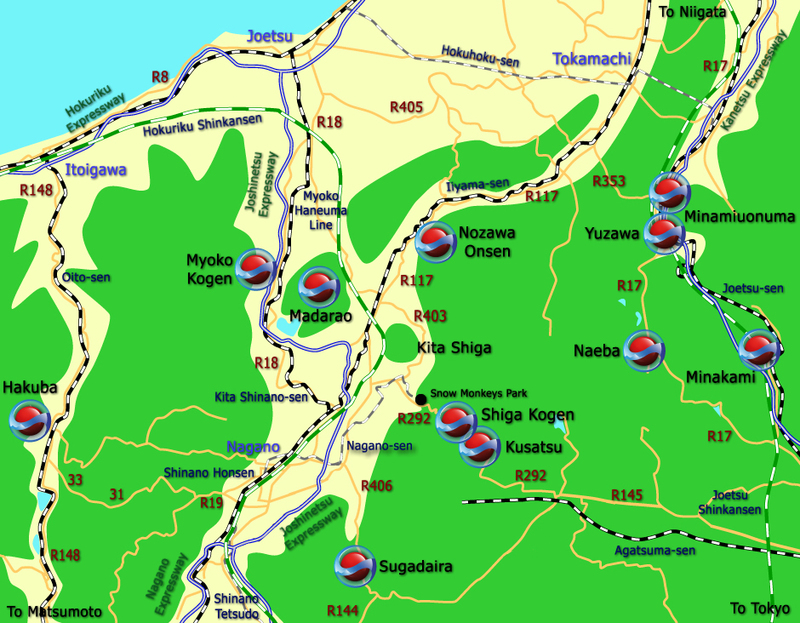 For detailed information on how to get to Hakuba by car, please go to this section.